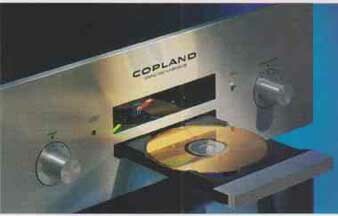 The Copland CDA 288 CD player was designed by Copland Research and Development of Copenhagen, Denmark, and is manufactured and marketed by Xena Audio AB of Vaxjo Sweden. Such cooperation in the audio and electronic fields is not uncommon across Scandinavian boundaries. Over the past few years Copland has been acquiring a growing reputation in Europe for well-built audio electronics. The company designs and markets interesting combinations of solid- state and tube technologies in addition to all-tube and all-transistor designs. On the European side of the Atlantic their prices are considered reasonable, given their products’ good build quality; technology content, and finish. Copland is now available in the US; the company makes its Stereophile debut with this review of its top-of-the-line CDA 288 CD player. This well-balanced design is 17” wide but measures 6.9” high — almost double that of standard slimline units. Black enamel is used for the casework, whose undamped, heavy-gauge steel accounts for much of the CDA 288’s considerable weight (35 lbs). Silver alloy constitutes the cleanly anodized faceplate, distinguished by just two control knobs of machined alloy and one small, chrome pushbutton, the latter so discreet that one might not even notice it. This button operates the open-close function for the slim CD drawer located beneath the central, fluorescent- green display window. With the left control configured as an old-style rotary power switch and no other buttons in sight, one might legitimately wonder how to manually operate the player with the one remaining. But the smooth-acting rotary knob not only controls track step forward or back, but selects Play and Pause when pushed in. Stop is achieved by operating the drawer button. When the display is in Off mode (dimming is available on the handset), no operating indicators are lit — save the green HDCD lamp, if such a disc is playing. When commanded, the display is illuminated and remains so for a couple of seconds, indicating the relevant operation. An IEC mains socket is located on the rear panel, along with high-quality gold-plated unbalanced audio outputs (nominally 2.5V maximum output), optical (TosLink) and coaxial (RCA) digital outputs, and an output off switch. (Though the CDA 288 is intended to be a standalone player, it can also be used as a transport.) It lacks such luxuries as a headphone socket or a remote volume control. The remote handset, made in Japan, has clear labeling and a quite logical but ton layout. Secondary controls available include display on/off, drawer open/close, time mode (elapsed, track, total), and index access. A 10-key numeric array allows for rapid track access and programming, these facilities including auto space (for track-seeking cassette dubs). Play modes include single-track and total, program repeat, and A—B repeat. The infrared control has a good range and is not unduly directional. Description: Single-box CD player using a TEAC VRDS transport mechanism, HDCD decoding, and optical (TosLink) and coaxial (RCA) digital outputs. Maximum output level: 2.4V. Output impedance: 30 ohms. Dimensions: 17” W by 6.9” H by 15” D. Weight: 35 lbs (16kg). Serial numbers of units reviewed: 1 9608-50-26-CDA 288, 19502-50-50, 19502-50-43. Price: $3200. Approximate number of dealers: 12. Manufacturer: Xena Audio AB, Vaxjo, Sweden, by arrangement with Copland Research and Development, Copenhagen, Denmark. The Copland CDA 288’s moderately priced TEAC VRDS mechanism uses engineering-grade polymer moldings rather than metal-alloy die-castings. Nevertheless, the standard of precision is high, with a low-resonance arm carrying the clamping plate that quells resonance in the spinning disc. The transport is centrally located and flanked by the power supplies on the left and a TEAC control and servo board on the right. Separate transformers serve the main sections: the first powers the digital and motor drive, while the second covers the analog department. The abundant multiple IC regulators provide good isolation between stages, though they tend to be remote from the locally decoupled circuit sections. Behind the transport lies the well-laid-out and well-packed digital decoder section. Copland has aimed for the top here, with no-holds-barred implementation of the popular Burr-Brown co-linear PCM63 20-bit DAC. And, touching all the bases, they have also installed the Pacific Microsonics PMD 100 digital filter, which automatically includes HDCD decoding when appropriate. Its high-resolution filtering is achieved at 8x oversampling; to accommodate the out put resolution without truncation and to pass the reconstituted “20-bit” replay of HDCD material, the output word length is also fixed at 20 bits. Using fast chip logic, Copland has chosen to further double the sample rate; this logic also inverts the digital data to provide a differential data highway. A pair of PCM63s is used per channel; i.e., in maximum-resolution, digital differential mode. By this means the already minuscule PCM63 nonlinearities should approach zero — assuming, of course, that such artifacts were a proven source of audible loss in fidelity and thus worth the effort. Lots of local and bypassed decoupling too much to count can be seen around the DAC array. With the high, 16x oversampling rate, very little analog filtering is required; a simple second-order, linear- phase Bessel type is used. Rather than op-amp ICs, the analog output stage features a discrete transistor amplifier with a differential input. This sums the DAC outputs to a single-ended signal. While there are DC offset controls pre sent on the board, the output amplifier is actually AC-coupled via a tantalum electrolytic capacitor bypassed by a small 0.01 uF film capacitor. On the board there’s a changeover pad for DC- coupling the output, but in practice the DC offset isn’t very low (I measured 25mV), nor is there any DC protection muting. Copland plays safe with their AC output option — unless your pre amp or amplifier is also known to have AC input coupling, in which case you may override the cap. Bearing in mind the Copland CDA 288’s high-end aspirations, I didn’t want to miss out on its potential by underestimating its abilities. I auditioned the player in two different systems: one appropriate to the Copland’s price region, the other closer to reference quality. This helped greatly in providing a perspective on overall performance. The higher-end system comprised a Krell FPB-300 driving Wilson WITTs, with both Conrad-Johnson Premier Fourteen and Audio Research LS15 pre amplifiers and direct coupling to a Krell KSP-20i/l CD player with its own volume control. The lineup that more closely matched the 288 included Mordaunt Short Performance 860 speakers and an Audio Research LS7 line stage. Power amplification was by Krell’s KAV-300i integrated, plus a Naim NAP25O and a Conrad-Johnson MV55. Other digital sources included a Naim CD2 CD player; a Muse Model 2 and an Audio Synthesis DAX-2 DAC (using the 288 and Krell as transports), plus a cheap but still good-sounding Marantz CD63 II. Connection was via Siltech and van den Hul cables, the latter of the pure carbon variety. I considered the use of various low-resonance supports, like the Mana tables, mandatory. The review sample was manufactured literally days before delivery in mid-October 1996. The CDA 288 required the usual few days’ burn-in, though some changes were evident in the first few hours following connection. The 288 sounded rather bright at first, and though this burned off somewhat over time, it never entirely disappeared, as the following report will explain. The measurements were all per formed on the original review sample Tins AC coupled unit has an extended response dead flat to 20Hz when loaded with the usual higher impedances, e.g. 50k-500k ohms - but it may show some mild bass rolloff with lower loadings (10k ohms or less) The maximum output level was 24V sourced from a very low 30 ohms impedance this 16dB above the usual 2V standard - so watch out when running A/B comparisons Channel balance was extremely good ±0 03dB overall over a 20Hz-20kHz bandwidth while channel separation was held virtually constant at 103dB or more again over the entire bandwidth The CDA 288 was essentially of flat response before tie emphasis measuring 20Hz-20kHz +0 05dB -012dB With de emphasis it remained flat to 5kHz then measured -0 04dB at 10kHz and -016dB at 16kHz - essentially as good as the primary response. The player didn't invert absolute phase Essentially linear phase the digital filter had good dynamic headroom, showing no signs of premature clipping on peak level white noise The transport operated quietly and efficiently, with clean loading, fast access, and good error correction for the test gaps on the Pierre Verany Test disc Up to 15mm gaps were rendered cleanly, with a hint of clicking at 2mm There was audible dropout on 2 5mm gaps Less than 1mm of protection is considered questionable while be than 2 5mm is rare to some degree the result depends on the fundamental design of the player and not unit to unit variation More representative disc faults may in any case be handled differently There are good indications that the intrinsic linearity of the digital decoder is higher than that of the Copland s discrete output amplifiers This is of no con sequence and is shared by designs from Krell to Conrad Johnson, Muse to California Audio Labs Thus the measured total harmonic distortion plus noise at full level of-89dB (00035%) is not only quite negligible, it isn't due to lack of low level linearity in the DAC. 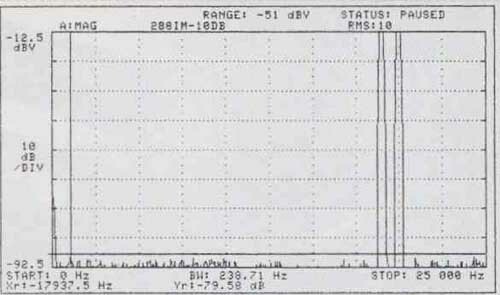 Measured at 10dB below peak level the THD+N was now -88dB equivalent to fill 16-bit resolution of this undithered test signal A better indication was given by the THD "result" for a 20kHz tone, where the high-frequency harmonics are be yond the system bandwidth The measured result, -100dB for any spurious intermodulation tones that may be pre sent within the audio bandwidth is fine. The Copland performed well with high frequency intermodulation reading -92.2dB (00025%) with 19kHz and 20kHz tones at frill level. Still, there was some impairment at the -10dB test level to a measured -80.6dB, or just over 0.01%. A check with the spectrum analyzer confirmed this result (fig.1). While the result gives no cause for concern, it is not readily obvious why this should be so. This analysis also showed a very good rejection of spurious modulation pro ducts, both above and below the driving frequencies - a fine result. Moving on to dithered single signals at lower levels, the measured distortion for a -70dB, 1kHz tone was at the reference level of -46dB. 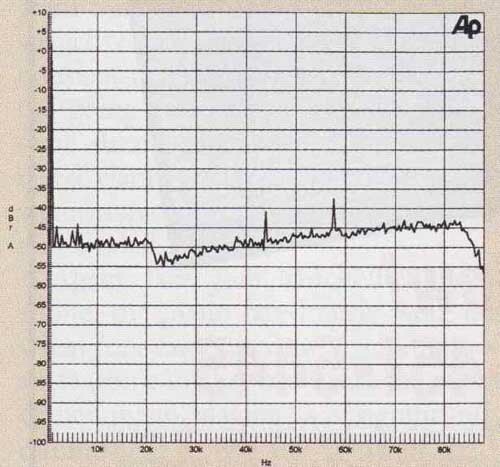 On the graph for the overall spectrum (fig.2), the distortion and noise in the audio bandwidth can be seen to be essentially below -115dB relative to full level, 0dBFS. There was a trace of 44.1kHz and 58kHz break through, but at negligible levels. The Copland could deliver clean sinewaves of fine linearity at —90dB, again dithered (fig.3). The undithered result is also shown in fig.3, and despite some display ringing the correct three step nature of this low-level waveform was clear enough and judged to be of good symmetry. Lacking the correct software for the Audio Precision System Two at the time of the review I measured the linearity by checking replay levels on dithered tones. The results were excellent, as Table 1 shows. These results indicate a replay linearity close to 20 bits, with very good channel match and monotonicity. 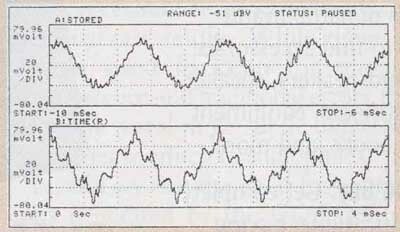 When measured at a —100dB level, the distortion reading was —26dB; i.e., 126dB below peak level. Signal/noise ratios were excellent: 109dBA, 107dB unweighted, and 101.5 dB CCIR ARM. Good filtering of ultrasonic and radio-frequency noise signals was shown up to a measurement limit of 250MHz. In summary, the lab test performance was generally excellent, with the kind of linearity and resolution typical of a fine execution of the digital technology. Fig.3 Copland CDA 288, waveform of dithered (top) and undithered (bottom) 1 kHz sinewave at —90dBFS (16-bit data). The CDA 288 proved to be one of the more difficult products I’ve had to assess recently. First impressions were very positive but misleading. To begin with, the 288 ran ahead of my ability to keep control of my reactions to the sound. Had I not spent more time (which, I hasten to add, I always do! ), working toward a deeper understanding of this player’s complex character; I might have misunderstood the intentions of its designers —which could well happen to other critics denied the luxury of extended listening. There was a lot in the Copland’s favor: a skillful, competitively priced, high- technology package with a pedigree associated with tube equipment; clean, fresh styling and finish; and a growing brand reputation. I admit it — I really wanted the CDA 288 to do well. However; I never quite came to terms with that brightness. It really sounded as if moderate treble lift was in force above 1 or 2kHz. (Here I’m talking about the balance as heard, judged by changes in the timbre and natural tonal color of musical instruments. However; there may well be no measurable treble lift on the test bench.) After the first few days the Copland’s treble started to sound fairly smooth (a lesson if ever I needed one not to make quick judgments), but the feeling of treble lift remained. To say the treble sounded bright is easy enough. I could add that Joni Mitchell’s piano on the title track of Blue lost its usual richness and bloom, sounding smaller and thinner; while Join her self was less husky, sounding more toothy and sibilant. There are several other ways of describing the effect—for example, to talk of the mids as bleached or whitened, the natural richness of tonal “color” somehow faded. Naturally bright material — such as Neneh Cherry singing “Manchild” on her Raw Like Sushi (Virgin 86116 2), a superbly timed track —was considered over the top, even with a tolerably well-balanced matching audio system. The character of available HDCD recordings is fairly laid-back compared with my several rock standards, and here the 288 fared better; the still present if mild perceived treble lift making less of a negative impact; indeed, on certain recordings it could be said to have enlivened matters. In general, HDCD replay compared favorably with non HDCD recordings. My notes record that on first hearing, I was seriously impressed. The 288 certainly sounded airy with a broad sound- stage, fine image depth, and very good detail. And the detail was undoubtedly impressive. Leading edges of transients were energetic, lively, full of impact and contrast. The treble sounded fast and clear; even sparkling. Simple percussion or solo material was carried very well, with a degree of spaciousness beyond its price class —for example, the opening movement of Stravinsky’s Firebird, with Eiji Oue and the Minnesota Orchestra (Reference Recordings RR-7OCD, HDCD). So what went wrong? It wasn’t just the treble, though perhaps I could have coped with this by including more Carbon cable, together with some judicious shift in the toe-in angle of my speakers. The answer is as complicated as the CDA 288 sound itself, as I con- tinned to listen, the mystery slowly unraveled. I wanted to know why I felt restless, swapping discs and not settling in for the duration of each. A brief re-acquaintance with the Naim CD2 (which was reviewed for Hi-Fi News &Record Review, and which Michael Fremer reviewed for Stereophile in February ‘97) drove the point home forcibly: lining and rhythm are not the 288’s fortes. In comparison with the $4100 Naim, Neneh Cherry lost her exquisite syncopation, and the sense of musical drive was impaired. Even digitally friendly MOR musician Dave Grusin, playing “Mountain Dance” on his Collection (GRP 95792), sounded tired. Almost as an aside, what had at first seemed a quite full-bodied bass that almost balanced the treble energy began to sound soft and ill-damped, lacking both speed and slam, and failing to stir my 12 woofers sufficiently in the lowest audible frequencies. The transport section is not the obvious culprit, as a quick linkup to the DAX-2 decoder proved. Moreover, as a single-box player, the 288’s decoder section has the benefit of direct and potentially jitter-free connection to its own onboard transport. What really caused the confusion was the matter of dynamics — I noted almost-mysterious, hard-to-pin-down changes in quality with increasing pro gram complexity and loudness. The airy, attractive clarity I heard with simple, transient-rich material began to fail when the going got rough. Then the soundstage shrank away, ambience was cur tailed, clarity suffered, dynamic contrasts were muted, and the sense of pace further eroded. Again, take Joni Mitchell’s “Blue”: Alone, the piano fared fairly well; but when Joni came in, central and in good voice (some say her best ever), the clarity of her piano playing was significantly diminished, as was the sense of space around both. On such occasions even the Mk.2 Marantz ‘63 sounded superior. Overall, the result was that I became rest less, the Copland’s performance detracting from listening pleasure and casting doubt both on my own judgment and on the player. In the end, in overall musical terms the CDA 288 only just held its own against the best budget-reference CD players. And in case there’s any doubt regarding siting and setting, I made sure that the 288 had the benefit of a three- tiered Mana Acoustics table, while the clear improvements to be obtained by switching off the digital “transport” out put, as well as muting the display, were duly noted and were indeed implemented for this appraisal. Measuring just about as perfectly as one could wish for, the CDA 288 is yet another example of a design whose sonic properties cannot be associated with conventional test results. ‘While these are often a good backstop for trapping incompetence and traditional errors, they still rarely reveal those subtle differences that matter so much to audiophiles. I could say that the good first impressions generated by the CDA 288 are probably due to its accurate performance in the lab; I could then speculate that, for a high-quality product, AC coupling of the output via an unpolarized tantalum electrolytic capacitor might indeed prejudice the sound without upsetting the measurements —but this would be second-guessing the design, and the designer could rightly accuse me of irresponsibility. Such speculation would require proper listening tests to back it up. Well-built and finished as it is, and with clean Techno-Danish styling that I, for one, find appealing, the fact remains that the CDA 288 didn’t really provide sufficient listening satisfaction. This isn’t a bad player; but it compares favorably with the best at the lower rather than the higher end of the price spectrum. At $3200, the Copland represents only average value, therefore. But by all means, try it for yourself- preferably over a weekend, at least — to see how you get on together. When Stereophile sent Copland the review preprint for a “Manufacturer’s Comment,” the company replied with a sorry tale of work in progress, plus a foul- up over an imminent revision to the player design, all of which resulted in what they described as an unrepresentative review sample. In particular Copland pointed out that while the measured results were fine, the final fine-tuning of the analog circuitry for what actually had been intended to be the new and hitherto unannounced model had not been performed. These enhancements supposedly would have delivered optimal sound quality. The manufacturers agreed that the revised sample might well have sounded inferior to the Standard 288. I am nevertheless driven to ask why Copland didn’t do a sound check before sending me the original review sample. I also have to wonder how a modest improvement to an established player that still tested superbly on the bench could so damage its sound. A second review model duly arrived, and was signified by an “X” appended to the serial number, now officially denoting the revision and the changeover to the new model type. It would, however, seem that Copland had originally in tended to deliver an “X” type to Stereophile without informing me or the magazine that this was what they were trying to do. Accordingly I set up a new set of listening evaluations comparing the second model, the “official” 288X, plus a standard 288 [ we originally thought we had been reviewing and which had been well- reviewed in other magazines—Ed. ], and the original review sample. Many thanks to all those who made this possible. The players look identical from the front, and for the test were only discreetly labeled on the back; they were assigned, coded, and presented randomly for com parison and were also referenced to key units — the Krell KPS-20i, Marantz CD63 II and Marantz CD17 K1. Monitoring was via an Audio Research LS15 driving a Krell FPB300 into a pair of Audio Physic Caldera 2 loudspeakers. Preliminary checks showed that output levels and other sonic performance parameters were well matched and were unlikely to prejudice the listening-test result Still, I suffered a setback when I discovered that, when fired up from cold, the original 288 occasionally exhibited intermittent distortion in the left channel at peak signal level. A further sample had to be airlifted to me. Fortunately, it arrived very quickly. It is with some regret that, after so much effort has been taken on all sides, I must report an essentially null result. To my surprise, when my results were decoded to reveal the identity of these players, the so-called “faulty” original review machine came out on top! Taking the comparison with the standard 288, the original review sample exhibited firmer; crisper bass, while both rhythm and timing were a little better, as were dynamics. Image focus was perceptibly sharper than for the older, established design. Turning to the result for the official production 288X, I was astonished to find that it hadn’t fared significantly better in the listening tests than the original 288. Yes, there were minor differences; for example, the new X version had a sweeter treble. But in absolute terms there was also a strange veiling, a lack of explicit clarity and presence, that appeared to be associated with perceptibly poorer dynamics. Still stranger was the outcome on rhythm and timing, the area said to be directly addressed by the X improvement. Here the bass lines were late, while rhythmic involvement was mildly impaired. In addition, the qualities of swing and subtle syncopation were found to be diluted in such classic rock recordings as Joni Mitchell’s Blue and Janis Ian’s Breaking Silence. As we discovered during the original review, assessing these players is mighty difficult. Contradicting the above commentary, and reminiscent of my comments in the original review, these Copland players continued to give surprisingly convincing first impressions. When you first listen to it, the final, official 288X does give the best impression. The bass sounds firmer and more powerful, the stereo image is more direct and better- focused. There is also an impression of greater attack and life. Yet give it more than a half hour; and move on to a medium-grade reference, and you immediately hear what you’ve been missing. Somehow Copland has managed to achieve a sound quality that sounds like good “hi-fi ” and that may well convince in the short term. At the same time I found a shortfall in musicality, in a sense of humanity from vocalists, and in longer-term enjoyment and satisfaction. This mysterious affair leaves the review findings basically intact, revealing only nuances of difference among all three samples, with my preference being for the first, “faulty” sample. On a numeric basis I find that I have scored all three test samples within 8% of each other for longer-term sound quality though none of them really hits the spot For the record, Copland originally was going to market both the 288 and the 288X. However; in January 1997 they announced that only the latest 288X will be made, together with the newer 277. It looks as if Copland has had unusually bad luck with this review project. I shall keep my ears open for further developments, and perhaps try out one of their new amplifiers. Slso see SoundStage review from July 1998.